Question:I recently bought an iPad so I could read my EPUB books for free. 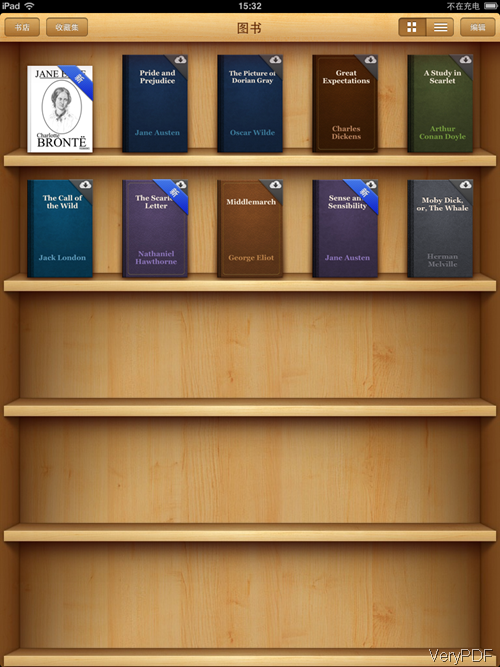 I have already downloaded a number of books to my iPhone, how can I get them on iPad without having to re-download all of my books. Thanks! Answer: According to your needs, maybe you can have a free trial of this software: VeryPDF iPad PDF Transfer. By this software, you can move your files from your iPhone to software then move those EPUB books to iPad. By this way, you do not need to re-download all the EPUB books again. In the following part, I will show you how to use this software. First, download VeryPDF iPad PDF Transfer. iPad PDF Transfer is designed to help you transfer PDF and ePub files between PC and iPad/iPhone /iPod touch. It also allows you to import, export and delete ePub and PDF files stored on any Apple mobile device under any Windows operating system. It has user friendly software interface. After downloading, there will be an exe file in the downloaded folder. Please double click the exe file to install it on your computer following installation message. If installation finishes, there will be an icon on the desktop. Double click it to launch this software, the following snapshot is from the software interface. Once you connect small device with computer, all the books in small device will be shown on software interface. By this software, we can move epub and PDF books from computer to small device or small device to computer or between small devices. The following snapshot is from iPad information. Second, transfer epub files between iPhone and iPad. Please make sure connect device like iPad to computer first or else there will be annoying popup message reminding you to connect device with computer. Meanwhile, if your device is not connected with computer, even if you want to import epub file from computer to your small device, that is unavailable. Then you can click the second button arrow to export files from ipad to your computer. Then connect your iPhone with computer and launch this software. Drag epub files from computer to software interface. By this way, those files will be moved to iphone. Up to here, the transformation from iPad to iPhone can call an end. If you still do not know how to use this software, please refer to this user guide. If you do not want to buy e-Books any more, self-made e-Books is an excellent idea. And this software VeryPDF PDF to ePub Converter maybe can help you a little bit more. During the using, if you have any question, please contact us by the ways supported on our contact us website. This entry was posted in iOS & iPhone & iPad and tagged epub to ibook. Bookmark the permalink.